If you’re looking for simple rituals to harmonize with the universe and live your dreams, you’re in the right place! Earlier this year while in Bali, the thing that most affected me was how much spirit interweaves with daily life. Each morning, people fill little cups made from palm fronds with flowers and small rice cakes, light incense, offer a morning prayer or devotion, and let the smoke from the incense carry that prayer to the sky. The flower-filled cups act as an incense holder, and often the cups are placed in a small shrine of devotion. These small shrines line the main streets of Ubud, and they’re also in many homes. All day every day, people stop to reconnect, recenter, and honor the invisible threads of the unseen. For many of us, such deep practices of devotion feel removed. Many people feel disconnected from themselves and the universe and aren’t sure how to reconnect. When we’re disconnected, we do many things that don’t serve us. Habits of escapism include too much social media, television, food, alcohol, work, and so many more. We search for ourselves and God in worldly things, things we hope will fill that longing in our souls for something more meaningful, but yet it never does. Often, this ironically makes us search harder in the same places, rather than shift our approach. Infusing ceremony and simple rituals into our lives is a powerful way to slow down, live intentionally, and find a deeper connection in a place that truly satisfies this longing for something deeper. Although this is the most natural thing in the world — our ancestors lived with ceremony and ritual long before Instagram existed to capture the moment — it takes a little bit of learning and reminding to adapt this to our own lives. When I returned from Bali, I promised myself that I’d infuse more simple rituals in my life. Six months later, I’m finally doing it. I’m a slow learner, lol. As I’ve healed more fully from burnout and reconnected with the divine feminine, too, it’s been interesting to see how ritual helps me pace my life, stay focused on my goals, and truly use my wild ambition as a tool that drives me forward rather than a neurotic impulse that threatens my health and happiness. Being a spiritual starlet is obviously about finding purpose and meaning, mixing ambition and spirituality, being a star in your life and the world, but also about honoring the unseen forces that are always there to support you. Ritual and ceremony help you calibrate yourself to the energy of the Earth and spirit world, allowing you to receive constant inner support and guidance from the universe to help you realize your larger dreams. Get the bonus list of 25 simple but nourishing rituals. Perfect for connecting with your soul and living in harmony with the universe. Omg! Your guide is on the way! If it doesn't arrive, check junk because you do not want to miss this. Yay! Ready to learn a few simple rituals? 1. Synchronize goals with the new and full moon. Every roughly 28 days, the moon completes a cycle, going from the totally dark new moon to the full, bright and radiant full moon. Linking goals with this cycle is a great way to move toward your dreams with flow and ease while staying focused and managing your energy. On new moons, I hold simple rituals and set intentions for what I want to create. I usually connect to three or four intentions, ranging from work to personal goals. Over the coming days, I make preparations and, as the moon grows larger in the sky, take bolder action toward realizing my intention. The full moon is a time of manifestation, of letting go. It’s the culmination of the cycle. After that, the moon begins to grow dark again. This is a time to wrap things up, rest and reflect. I definitely plan on talking about this more in The Society of Spiritual Starlets, my new membership community. On the last new moon, I set the intention to welcome 197 people into The Society, and it was cool that the universe guided me, as part of reaching that goal, to film the opening invocation on the full moon, which was also the century’s most powerful lunar eclipse! I know that over the coming months, the electric energy of that space will attract other like-hearted people ready to create soulful lives. In the meantime, I’ve created space to rest, relax and receive as the moon wanes rather than continue to push forward, like I used to do. Living this way feels like floating on the ocean, riding the receding tide before feeling the energy gather, ready for another monumental wave. Here’s another article about living in harmony with the moon cycles. 2. Create a morning ritual. I used to HATE the morning, and am notoriously cranky, but then I realized it wasn’t the morning itself that soured my mood, but the feeling of being rushed. If we’ve talked before, you know I don’t schedule chats before 11 a.m.! Each morning when waking, I meditate for about 20 minutes, and then do an oracle card reading. Then, I usually write in some way, whether that’s journaling or writing my daily message on Instagram and Facebook. The thing about simple rituals for morning is they should be doable, with a few things that help you connect and set a positive intention for the day. While in yoga teacher training, one guy felt like he had to do a complete Ayurvedic ritual each morning, and was always adding different things we talked about during class. His ritual soon extended into the afternoon and he felt overwhelmed, not able to get anything else done! That’s the opposite of simple rituals! For us spiritual starlets, we need a morning ritual that will connect us to the universe, our goals and dreams, and get our minds right for the day ahead. I recommend picking one to three things and then creating time (it’s not about HAVING the time, it’s about CREATING the time) to start your morning this soulful way! I freaking LOVE oracle cards! They’re the best simple ritual. Awhile ago, I bought my first deck thinking it would be fun, but couldn’t see how it would make a meaningful impact on my life. But OMG! The cards are always eerily accurate and exactly what I need to hear. Everyone has different ways of working with the cards. I usually tune into which deck I feel like pulling from, and then shuffle three times before picking a card straight off the top. Other people will split the deck, and continue shuffling by placing the bottom half on top again and again until a card pops out of the deck or sticks out in an obvious way. I definitely pay attention to this, and see when cards fall out or literally jump at me. If that happens, I go with it. If I’m feeling especially saucy, I’ll just start pulling random cards and read all of them. Why not? You can also do three-card spreads for past present and future, or to get a feel for the month ahead. So many options! You may also enjoy this post: How to ask for help from the universe. I honestly haven’t been super good about this, but improving my sleep habits is a big priority of mine. Something I love doing is to get out my yoga mat, play some chill tunes or healing music on Spotify (I love chakra healing music or theta waves) and do restorative or yin yoga. You might enjoy this post about yoga poses to release emotions from the body. The key to making anything a ritual is awareness. Bring awareness to the practice, have an intention, and open your heart to connecting with yourself and the divine rather than allowing yourself to replay the day incessantly or worry about tomorrow. Also feel free to incorporate the elements, like fire (perfect for burning away things you no longer need). Candles and incense make simple rituals feel sacred! I made a list of 25 simple rituals just for subscribers. Download it below! You missed an epic shadow work training! 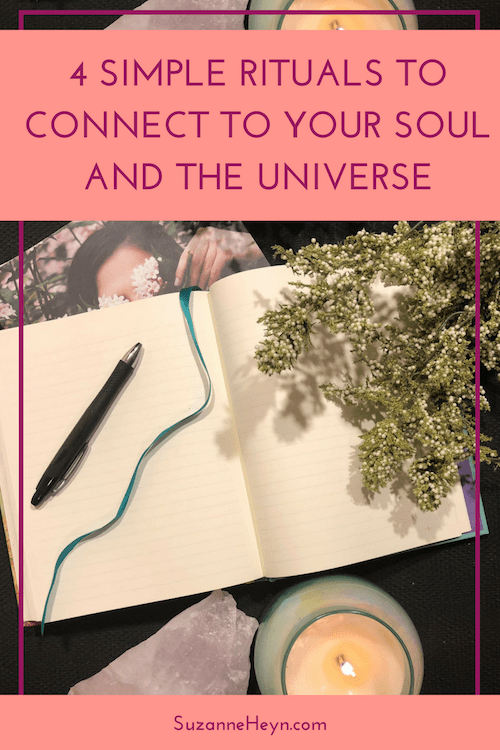 If you’re ready to truly, madly, deeply connect to your soul and create a life based on that connection, then I made you something! The Society of Spiritual Starlets is where you’ll learn all my saucy secrets for creating a life around your quirks and craziness rather than trying to hide it and going legit crazy (not the fun kind) in the process. Shadow work was our first training, and the invocation has also been filmed. You can watch them right now! People said my 6-step process helped them release resentments they didn’t know they had and feel overall much lighter and more at peace. Feel utterly whole, divinely connected and supported by an infinitely abundant and loving universe. Have a deep, unwavering connection to your soul that guided you through all of life. Enjoy peace and happiness straight through the core of your being. A grounded calm you’ve never known before. Value yourself so deeply and completely that setting boundaries, practicing delicious self-care, following your dreams felt like the most natural and inevitable thing in the world. Embark upon a path of deep self-discovery, unconditional love and rapid personal growth. Transform pain into power and fuel to manifest your wildest dreams. Uncover your soul purpose and heart-felt longings. Reprogram your mind and energy body, deleting all subconscious sabotage so you create what you desire from ease and flow. Co-create with the universe, receiving a constant flow of guidance and support as you manifest a soul-aligned life. Connect with a community of soul-aligned people who will encourage you to go big rather than play it safe and stay small. I’ve finally made a sales page for it, too! Check it out here and join us.